Background: Calcium hydroxide pastes used in the endodontic therapy may produce changes in the physical properties of the dentin. Objective: The purpose of this study was to evaluate the effect of calcium hydroxide pastes and their vehicles on microhardness of root canal dentin. Materials and Methods: Sixty maxillary anterior teeth were used. The crowns of the teeth were removed at the cemento-enamel junction. Canals were instrumented, horizontally sectioned into 2 segments, embedded in acrylic resin, and polished. A total of 120 specimens were randomly divided into 12 groups. Specimens stayed in contact with the vehicles or the pastes prepared with the calcium hydroxide powder and the same vehicles. The vehicles are: Distilled water, chlorhexidine, carticaine in the anesthetic solution, propylene glycol, monochlorophenol and monochlorophenol - propylene glycol. The references Vickers microhardness were obtained prior the application of the medicaments. Samples were then exposed to the medicaments for 3, 7, and 14 days, and microhardness measured again. The results were statistically analyzed by one-way ANOVA, Tukey test, and regression. Results: All vehicles and pastes, except distilled water, significantly decreased the microhardness of the root dentin; however, calcium hydroxide + camphorated monochlorophenol - propylene glycol and camphorated monochlorophenol - propylene glycol showed the highest decrease. Conclusion: Vehicles contribute to calcium hydroxide reduction of root canal dentin microhardness as constituent of endodontic pastes. 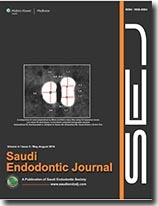 Aim: The aim of this study is to evaluate radiographically the quality of root canal filling in mesiodistal and buccolingual view when comparing matched cone condensation and warm lateral Gutta-percha condensation using system B heating instrument in a low-heat warm lateral condensation technique in0 vitro. Materials and Methods: A total of 40 mandibular premolars with straight single canals were divided into two groups with 20 each. The root canals were shaped by hand file and Revo-S rotary files to size (25, 0.06) at the end point, then they filled by Gutta-percha cone and meta-seal sealer. In group A, a single matched cone technique was used to fill the root canals. In group B, a hot lateral condensation using system B instrument at 101°C was performed. Result: The result of this study showed no significant difference in density of Gutta-percha fill in apical and coronal two-third when comparing matched cone root canal filling and hot lateral technique (P > 0.05). The only significant difference (P < 0.05) was in matched cone between buccolingual and mesiodistal view in the coronal two-third. Conclusion: Within the limitation of this study, single matched cone technique has a good density in the apical one-third as that of the hot lateral technique so it may be used for filling narrow canals. 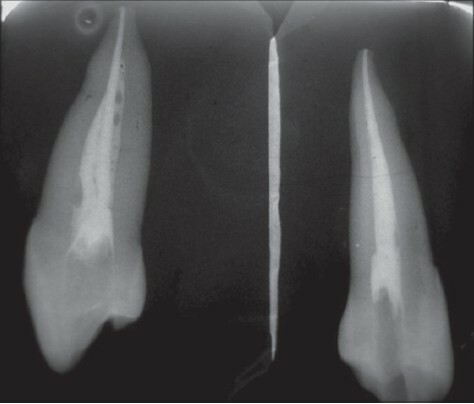 In the coronal two-third of the root canal, single matched cone technique showed inferior density of root canal filling which can be improved by using accessory cones Gutta-percha in wide canal. Aim: To evaluate and compare the volume percentage of root canals obturated with gutta percha (POV), with various techniques using spiral computed tomography (SCT). 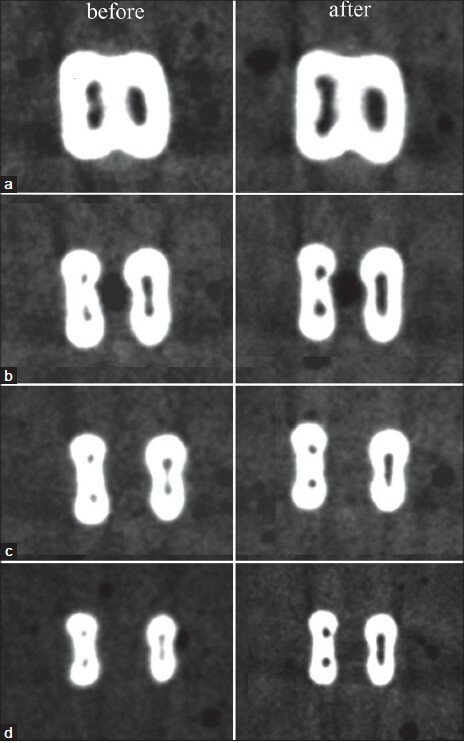 Materials and Methods: Forty-five mandibular first premolar teeth were instrumented using Race files and randomly divided into three groups of 15 teeth each (n = 15). 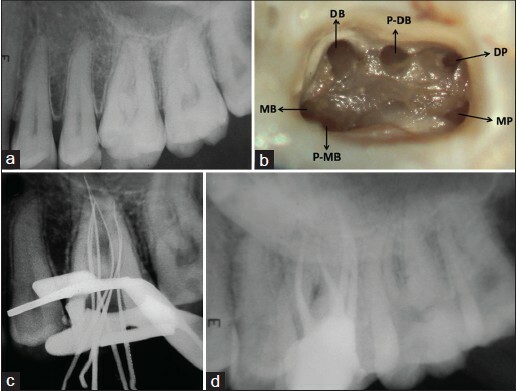 The volume of root canal space was measured using SCT and the root canals were obturated as follows: Group 1-lateral condensation, Group 2-single-cone obturation and Group 3-thermoplasticized gutta-percha technique. The filled volume of root canals was measured using SCT and POV was calculated in total and at apical, middle and coronal third individually. 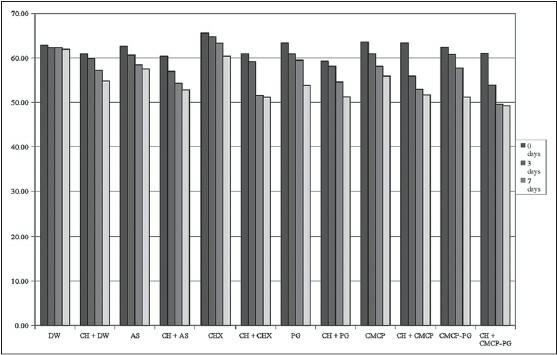 The data was statistically analyzed using one-way ANOVA and Tukeys post hoc multiple comparison tests. Results: An intergroup comparison of the mean value of POV showed a statistically significant difference ( P < 0.05) in the middle third and in total when group 1 was compared to group 2. Conclusion: All the groups showed 100% POV at the apical third. Group 2 showed least POV at the middle third of the root canal. Presence of palatal radicular grooves are considered to be an important contributing factor to the development of localized periodontitis, as it favored the accumulation and proliferation of bacterial plaque deep into the periodontium. Pulp involvement could result due to the introduction of bacterial toxins through channels that existed between the root canal system and the groove. Early diagnosis, elimination of inflammation and correction of anatomic complications are the key to a favorable outcome for managing palatoradicular groove. Present report describes successful management with an interdisciplinary approach of maxillary lateral incisor with combined endodontic periodontic lesion associated with palatoradicular groove. The purpose of this article is to describe a clinical case of a maxillary first molar with three roots and six root canals.The clinical detection of the six canals was made using a dental operating microscope and conﬁrmed using multiple angled radiographs.This report serves to remind clinicians that such anatomical variations should be taken into account during endodontic treatment of the maxillary molars. Management of tooth avulsion in the permanent dentition often presents a challenge. 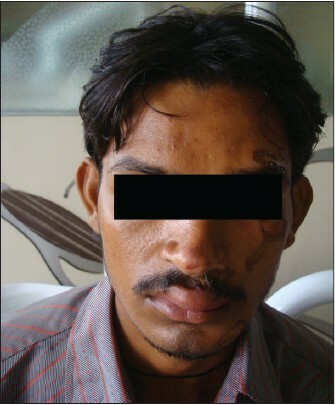 Definitive treatment planning and consultation with specialists is seldom possible at the time of emergency treatment. Replantation of the avulsed tooth can restore esthetic appearance and occlusal function shortly after the injury. This article describes the management of a patient with an avulsed maxillary permanent incisor that had been air-dried for about 40 h. The replanted incisor retained its esthetic appearance and functionality 1 year after replantation, yet the long-term prognosis is not good because of progressive replacement root resorption.